And Sen. Coburn is TICKED. This tweet probably alarmed a lot of people. Dan Scavino, of the Trump campaign, claimed that Tom Coburn trashed Ted Cruz as “without a doubt, one of the most dishonest people in DC.” That would indeed be a scandalous and damaging thing if it had happened. But it didn’t happen. It’s a lie. So it is presented as a quote, and retweeted by The Donald himself. No clean hands here. 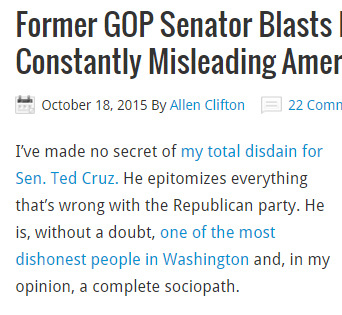 The ForwardProgressives writer said that about Cruz. The Trump camp took that line from the article, and in a tweet, faked it as a “quote” from Senator Tom Coburn. “To me, it’s more of loose play with the truth and loose play with the words,” Coburn said. As Jake Tapper notes, how interesting that the question at hand is about honesty. Trump loves to call people liars, and then he lies about calling them liars. Just like he lies about his charitable giving, his eff-bombs, and who knows what else? Maybe we should make up our own quotes. “Donald Trump’s campaign is the most dishonest smear job campaign in the history of American politics,” says that screaming goat from YouTube! Hey you don’t know. You don’t speak Spanish OR Goat, right? By the way, one good thing that came out of this? Sen. Coburn just narrowed his choices. “I can tell you now somebody I’m not going to vote for,” he told the Examiner. Would that the sentiment would spread. UPDATE: Both Trump and Scavino have deleted their tweets. No new tweets with an apology or even a retraction were made. WASHINGTON–Former Sen. Tom Coburn, R-Okla., on Thursday night accused Sen. Ted Cruz of stymieing Congress with divisive rhetoric and irresponsible promises. You guys need to start reporting all sides. You’re not looking at the negs on Cruz. I’d like to know exactly what he’s “lying” about. Blanket statements of Cruz supposedly “lying” are coming from Trump… which is comical seeing that Donald Trump is a habitual liar. Same thing about Trump saying Cruz is “nasty”. Seriously? Trump is one of the nastiest human beings on the planet. He throws around continual obscenities while screaming and threatening to sue everyone. Impressive post.Thank you a lot. Interesting thoughts. Thank you for sharing. *SIGH* And he has the nerve to accuse the media of libel. Talk about Pot and kettle. Or in this case, honey pot and toilet.